Where can I buy Flexitables? You can order now from one of our distributors. Just click the relevant country flag below to find your nearest supplier. Our addition & subtraction grids are hands-on, manipulative sheets for the classroom to help teaching adding & subtracting skills to kids. 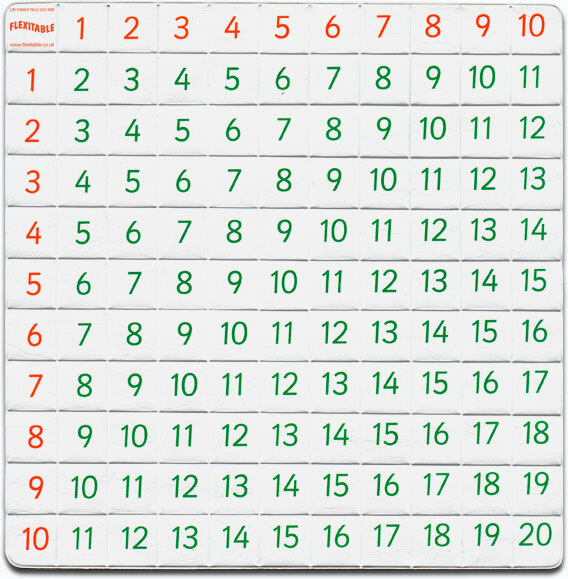 The orange numbers that run across the top of the grid and down the far left hand side act as the addends in addition. In subtraction they act as the subtrahends and differences. a) Look along the top row and find the 4.
b) Fold the table from the top to bottom, vertically, back under the numbers 1 – 4.
c) Keep the table folded and look down the left hand column for the number 6.
d) Fold the table up, horizontally, under this row. Please choose the items you wish to buy from the list below. Each time you click a link you will be taken to our SHOPPING CART page where you can specify quantities. After that you can either ‘GO TO PAYMENTS’ to complete your order or ‘CONTINUE SHOPPING’ which will bring you back to this page.